This native annual is a member of the caper family, Capparaceae. It grows to a height of 12-36". Blooms May through October. 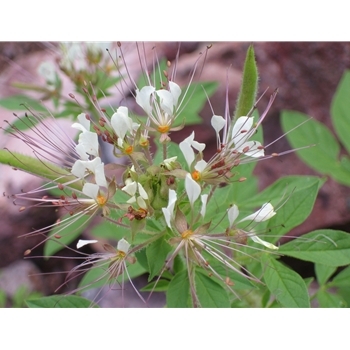 It has elongated flower clusters, 2-6" long, of frilly, white flowers. Each individual bloom measures 3/4" wide, has four clawed petals notched at tips, and many protruding pinkish purple flower parts. Dodecandra means "having twelve stamens" in Latin, referring to the long obvious flower parts. Leaves are stalked, dark green, and grow to 2 1/2-4" long. The leaf is divided into three fine-haired elliptical leaflets. Upper leaves are smaller. The foliage of this sticky-haired annual has a rank resinous odor and so many glands on its surface that it feels chilly and moist, thus the name "Clammyweed". Often cultivated for the scentless airy flowers it self sows readily. It ranges in a wide band down the center of AZ, from the northern to southern borders. It is found in desert scrub habitat at 1,000-6,500' along roads, washes, disturbed areas and on the banks of streams.